A friend and colleague, Carla Kimball, recently visited our home to see our shower. Sound strange? Perhaps, but I love to take discarded material and give it new life. 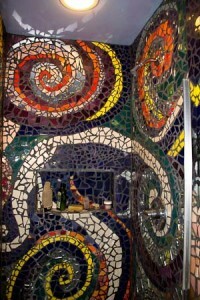 In this instance in 2004, I used broken plates, tiles and mirrors to create a mosaic in our shower, photographed by Carla. On her Revealed Presence Photography blog, she accompanied the picture with the question: “How is your life a work of art?” Thanks for visiting!